Protect your furniture with these stylish bonded leather coasters. 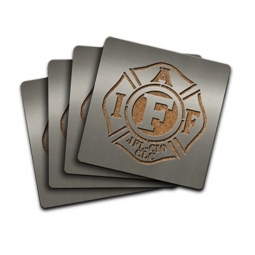 Burgundy color finish on 1 side with debossed IAFF maltese logo. Opposite side is natural leather. Set of 4 coasters is packaged in a clear-top tin. Each coaster is approx. 3 7/8" diameter x 1/8" thick.